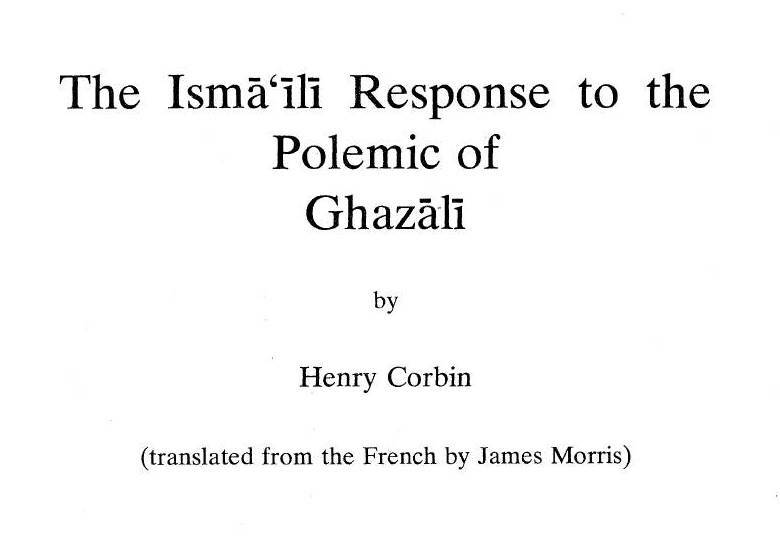 Henry Corbin introduces and summarizes an Ismā‘īlī Muslim response to a polemical work undertaken against the Ismā‘īlīs by the famous theologian Abū Ḥāmid al-Ghazālī (d. 505/1111). Al-Ghazālī’s work against the Isma‘ilis was titled Kitab faḍā’iḥ al-bāṭiniyya wa faḍā’il al-mustaẓhiriyya (“The Shames of the Bāṭinites and the Excellence of the Supporters of al-Mustaẓhir”) and the Ismā‘īlī response by Da‘ī ‘Alī ibn Muḥammad ibn al-Walīd, the fifth dā‘ī al-mutāliq of the Mustalian Isma ‘ilis in Yemen, was titled Damigh al-batil wa half al-munazil (“The Destroyer of Error and the Death of He Who Would Defend It”). It’s interesting that the brilliant Ghazali spent a good deal of his time and intellectual capital attacking Ismaili ideas and doctrine yet in his later years he embraced the same esoteric dimension of religion(albeit from a Sunni perspective) that he had fought so hard against during the earlier part of his life. I guess some of the ideas the al batiniyya espoused rubbed off onto him.